Pictured below is a controller we recently made based around our standard 2014 Solar Pump Controller. The modifications and additions have been made so that this device can be used to safely control the pump for a small solar heated pool located in sunny Egypt, ensuring that neither the pool nor the solar panel will overheat in the extreme weather conditions found there. With our standard controller, the pool temperature could become unpleasantly or dangerously hot in very sunny climates. 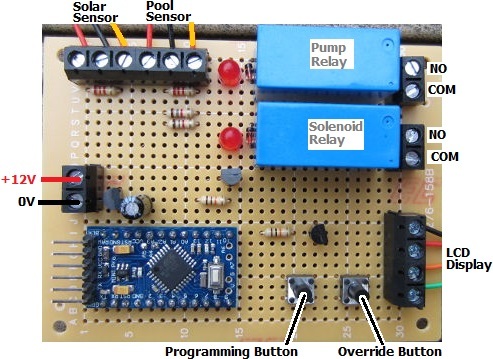 We have made many controllers which automatically turn off the pump if the pool temperature exceeds a user set threshold (such as this simple solar hot tub pump controller). However, just turning off the pump in the middle of summer in Egypt could easily result in the the contents of the solar collector boiling which could also be dangerous and damaging. Therefore this particular controller can be set up by the user (via the on board buttons and provided LCD display) with a maximum pool temperature. If the pump is running (because the solar collector is hot) and the pool reaches the maximum temperature, a relay closes which turn energises a solenoid valve. This valve will divert the solar heated water away from the pool and through a copper coil into a vented tank or barrel where it can boil/evaporate off safely. A float valve at the top of this container will top it up with cool water to replace evaporative losses. When the pool temperature falls by two degrees, the solenoid valve will be de-energised and the solar heating of the pool will start again. If you need any kind of solar water heating pump controller, have a look at our range of off the shelf products here: Solar Water Heating, and if you cannot find something suitable, email neil@reuk.co.uk with details of your exact requirements so that we can design and build you something.